Don’t try to tell one stubborn little mermaid named Aeriel that the seaweed isn’t greener on the other side of the surface. 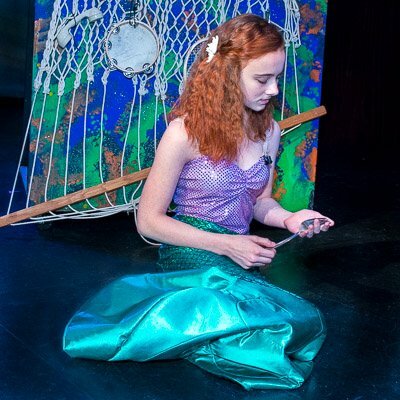 Director Michael Kelley’s Blake Middle High Summer Theatre Institute brought the Little Mermaid and her sisters, her dad King Triton, Sebastian, Flounder, Scuttle and company to Blake’s mainstage to cap off their four-week 2015 summer session. The Theatre Institute, one for middle high and one for high school students (browse the Legally Blonde photos after you’re finished here!) introduces budding and experienced actors and theatre technicians to a lot of the aspects of creating a show from set construction to singing, dancing and acting, to a taste of directing their own skit, to some improvisational comedy in front of the hundreds in the audience. And there’s one seriously unpleasant sea witch, Ursula, who makes deals with unsuspecting people and then collects – and sings about – those poor unfortunate souls. Rehearsal and performance photos are combined in story order for Little Mermaid for a little better continuity. Lighting was more dramatic for the shows when I was tethered to the back of the theatre, but I was able to roam around freely during rehearsals for closeups in more even lighting. I hope the mix presents you or your actors and actresses in everyone’s best ‘light’. No surprises here. Oliver Warbucks adopts Annie, the orphans get homes, Miss Hannigan, Rooster and Lily are off to the slam, and 20+ middle-high actors and actresses in the Blake Summer Theatre Institute put on an amazing show in just under four weeks. Directed by Mr. Michael Kelley, acting assistants Richard Muhammad and Charles Harper, stage manager Yasmin Wamala and a host of other great people, the summer Institute, in its fourth year, brought not only a fabulous show, but a round of improvisational comedy by the cast after the show. How adept are YOU at building on an emerging story line at the instant the director points in your direction? You’d better not repeat or drop the story line; doing so means that you have to choreograph your own demise (dying scene)! Enjoy these photos from Thursday’s show and Friday’s dress rehearsal. There are other photos on the way that will give you a backstage look at what goes on at the Summer Theatre Institute, so check back. Quite a few of you have asked about purchasing some of these. Thanks for your kind words! My primary goal was to give our thespians something to look at and show off after the Institute was over for the year. I’m an old school film photographer, though – from the days when we enjoyed prints by making them big and hanging them on walls – and have decided to make these available as real photographic prints. Not the ink jet kind, but the ones from a real pro lab that will look as good as photos under very challenging and changing stage lighting can look. The Blake Stage Company Boosters are a big source of financial support for the Stage Company to use to add microphones, buy real stage paint (more expensive but worth it), stage makeup (also more expensive; also worth it) and whatever else Directors D’Anna and Kelley need to put on these fantastic performances. One might think that a lot of funding for the arts magnet school would come from the county, wouldn’t one? Reality is that we’re completely self-funded and Montgomery County only restricts how we can raise and use money. I’ll donate 25% of the print price to the Boosters to help keep Blake Stage Company healthy for our young to enjoy for the years to come. DIGITAL IMAGES or FINISHED PRINTS! Images are now available as digital downloads. Select the Digital Download option for each image you wish to purchase. Please read this before ordering. This is your gateway to photos of Blake Stage Company productions starting in 2012 when Addison moved into high school, infected by the theatre but that found its way into her blood in middle high under the direction of Erin Lorenz. Ally is following suite, having been onstage with Addison in Legally Blonde The Musical. I’m working to get all of the shows into a consistent format, but they’re no less consistent than they were on the old site. You’re looking for production stills, though, and not a beautiful web site. 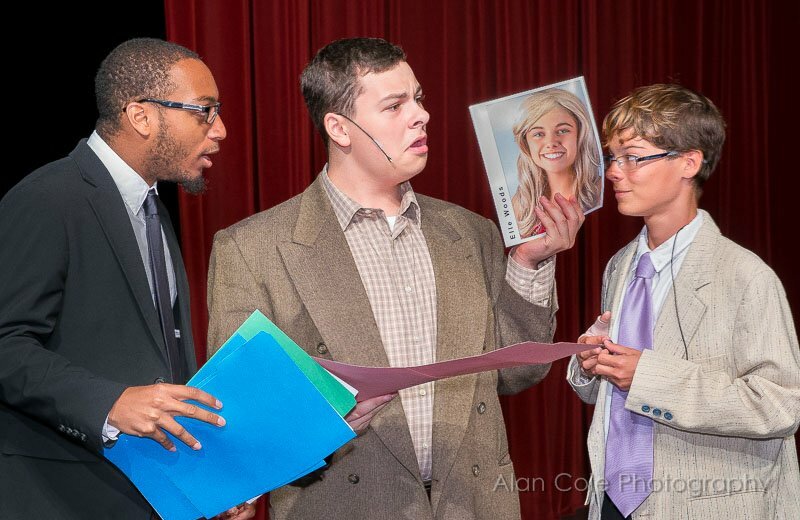 Introducing this theatre program in a few sentences is like trying to capture Disney in a few photos. This constantly arriving and graduating troupe, under the direction of Mr. Michel D’Anna and backed by the artistic set stylings of Mr. John Ovington, amaze audiences show after show. 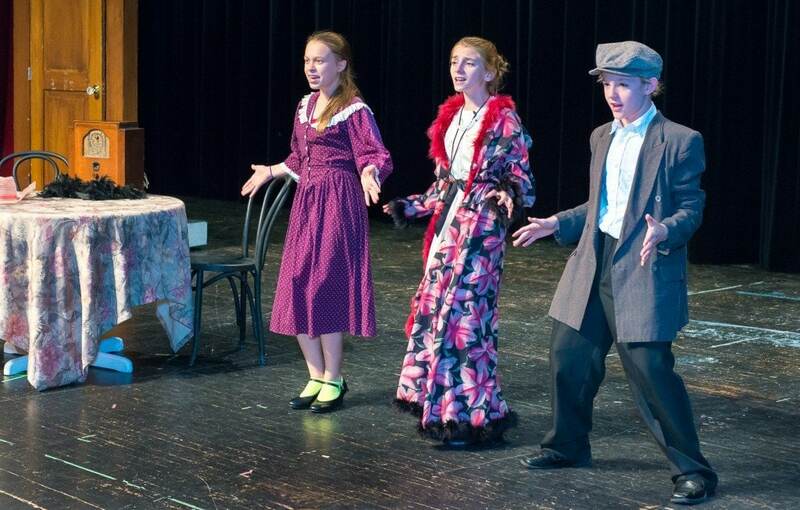 Blake’s four-week Summer Theatre Institute adds to everyone’s chance to hone their singing, dancing and dramatic skills by adding a third major production to school-year spring and fall shows. 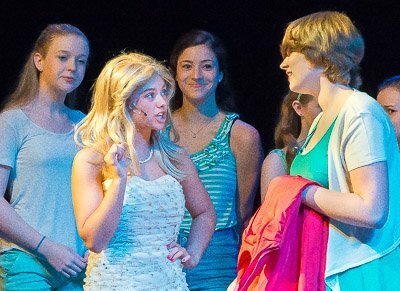 Summer session also brings in student-actors from schools throughout the area and as far away as Nebraska. 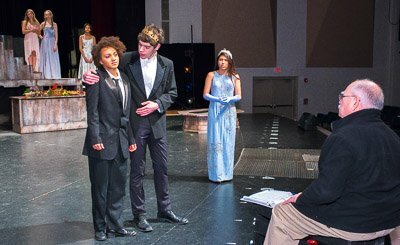 The Institute has also brought in talent including professional acting and voice coach Harry Winter, collegiate acting coaches and Blake alumni Charles Harper and Richard Muhammad, and choreographer and Blake alumnus Michelle Carter to make the theatre experience even more spectacular for both actors and audience. 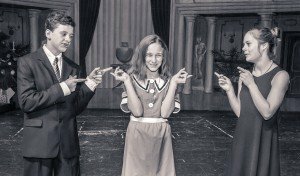 A four-week middle-high version of the summer Institute under director Michael Kelley gives budding thespians as young as rising sixth graders a chance to experience the big stage and decide whether the spotlights or stagecraft are calling them. Quite a few of you have asked about purchasing show photos. Thanks for your kind words! My primary goal was to give our thespians something to look at and show off after the Institute was over for the year. I’m an old school film photographer, though – from the days when we enjoyed prints by making them big and hanging them on walls – and have decided to make these available as real photographic prints. Not the ink jet kind, but the ones from a real pro lab that will look as good as photos under very challenging and changing stage lighting can look. The Blake Stage Company Boosters are a big source of financial support that enables Stage Company to add microphones, buy real stage paint (more expensive but worth it), stage makeup (also more expensive; also worth it) and whatever else Directors D’Anna and Kelley need to put on these fantastic performances. One might think that a lot of funding for the arts magnet school would come from the county, wouldn’t one? Reality is that we’re completely self-funded and Montgomery County only restricts how we can raise and use money. I donate 25% of the print price to the Boosters to help keep Blake Stage Company healthy for our young to enjoy for the years to come. Thanks for supporting Stage Company through your print purchases. Theatre Lobby Posters for many of our shows are ready for your walls. Additional posters will appear from time to time, so check back occasionally! The SS American has sailed away with Cole Porter’s Anything Goes! You either made the ship’s departure with Hope Harcourt, Lord Evelyn Oakleigh, Stowaway Billy Crocker, Evangelist Reno Sweeney and her Angels, Public Enemy Number 13, Erma, the Reverend and a cast of other passengers – or you didn’t. 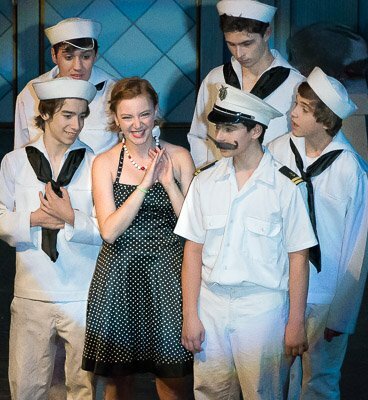 These unlikely shipmates went from a mixture of old classmates and new faces to a polished musical in about twenty short days during the 2014 Blake High School Summer Musical Theatre Institute under the direction of Mr. Michael D’ Anna, assisted by technical director John Ovington, renowned actor Harry A. Winter, musical director Rachael Lader and choreographer Michelle Carter. 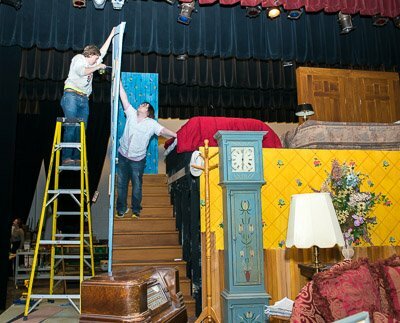 The cast got a taste of not only acting, singing and dancing (some learned to tap in under three weeks..), but set design, construction and painting, makeup, sound, lighting and the other aspects of theatre. Consider the Institute next summer even if you missed the boat this year! 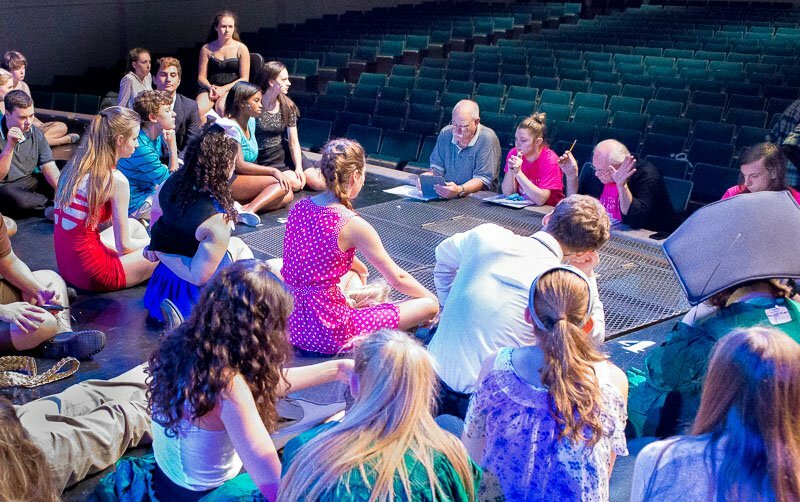 Visit Blake Stage Company’s home online for more details about plays throughout the year and next summer’s Institute. You should find plenty of celebrity photos of yourself or your actor or actress from Thursday and Friday shows. Saturday’s photos are offline right now but bear with me and they’ll appear. I’ll go through my rehearsal photos to look for any crucial moments I missed here, but show photos have the advantage of a complete set and that extra punch that comes from playing to a live audience. Sure, there are way more than enough Friday scenes, but I hope you’ll enjoy piecing the story back together from the hundreds of points in time. Double-cast leads from Thursday – stand by for more as I have time, but I’ve captured you at the peaks of your glories in what’s online now. Join Eugene Morris Jerome and his extended family as he comes of age in Brooklyn in 1937, dreams of becoming a writer, and sees, at last, the golden palace of the Himalayas. 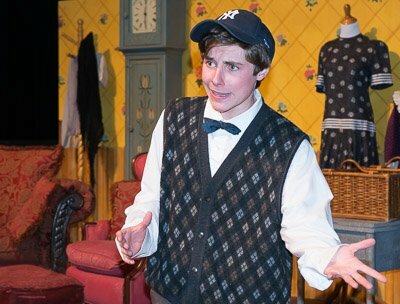 Blake Stage Company’s spring show, based on an semi-autobiographical snapshot from Neil Simon’s childhood, featured a limited but lovable cast of characters and an elaborate masterpiece of a set that this writer challenges you to nest in any high school anywhere.